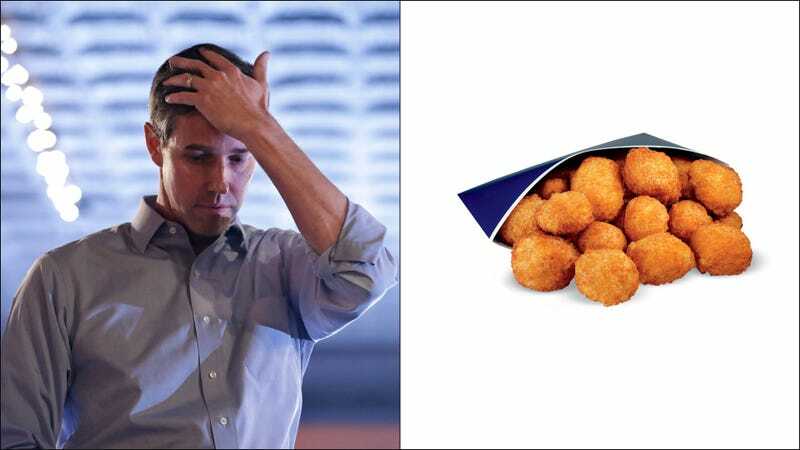 Perhaps Beto O’Rourke just enjoys a good crinkle-cut fry. But that’s no defense in the vigilant eyes of the internet, which has taken presidential hopeful O’Rourke to task for ordering fries rather than cheese curds alongside his Culver’s burger and custard. O’Rourke visited Wisconsin this weekend just days after announcing his presidential run, where he tweeted the photo of himself enjoying a meal—sans cheese curds—at Culver’s. We’re likely all aware that food is a fraught topic for politicians. They’ve been criticized for being too thirsty (in the physical sense), for endorsing a taco bowl, for guzzling Diet Coke like it’s the last beverage on earth, for consuming Michelob Ultra, and for eating salad with a comb, to name a few. Why is food such a landmine for politicians? Because it’s a yardstick by which the American public judges a public figure’s authenticity. Eating is relatable and easily understood. Almost any American with a Twitter account can make a wisecrack about cheese curds; it’s more difficult to pen a take-down of a candidate’s tax policy in 140 characters. Americans use food as proxy for realness. And candidates invite that. O’Rourke didn’t have to stop at Culver’s while in Wisconsin, but he’s savvy enough to know the optics of a politician eating “hometown favorite” fast food makes for a nice photo op. Unless, of course, you forget the cheese curds. We’re not here to heap shame on O’Rourke. The man likes a crinkle-cut fry, and there’s hardly anything wrong with that. But we can’t help but feel a twinge of—what is this emotion, sympathy? pity?—for a person who doesn’t recognize the deep-fried joy of a battered cheese nugget. As O’Rourke heads to Michigan today, hopefully a campaign aide briefs him on proper Coney dog etiquette. May we suggest a Vernors instead of Canada Dry with that order?